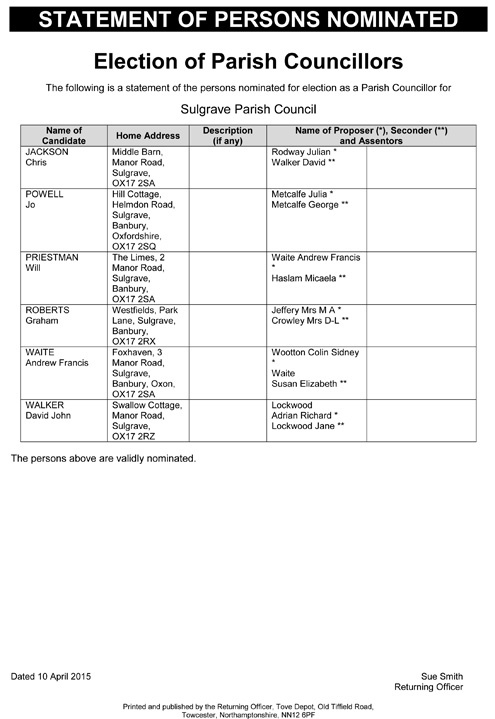 As can be seen from the above Statement of Persons Nominated for Election, there are six nominations for the six vacancies on Sulgrave Parish Council. There will thus be no election of Parish Councillors. The six persons nominated will be declared elected and will form the new Parish Council. This entry was posted on Sunday, April 19th, 2015 at 7:52 am	and is filed under News. You can follow any responses to this entry through the RSS 2.0 feed. You can leave a response, or trackback from your own site.